If you’ve read anything I’ve written about tabletop games, you’ll know that I tend to favor games with an engaging theme. But that is not to say that I am opposed to playing a good abstract game. Oh no! On the contrary — there are some that I enjoy a great deal. One of these such games is SET. 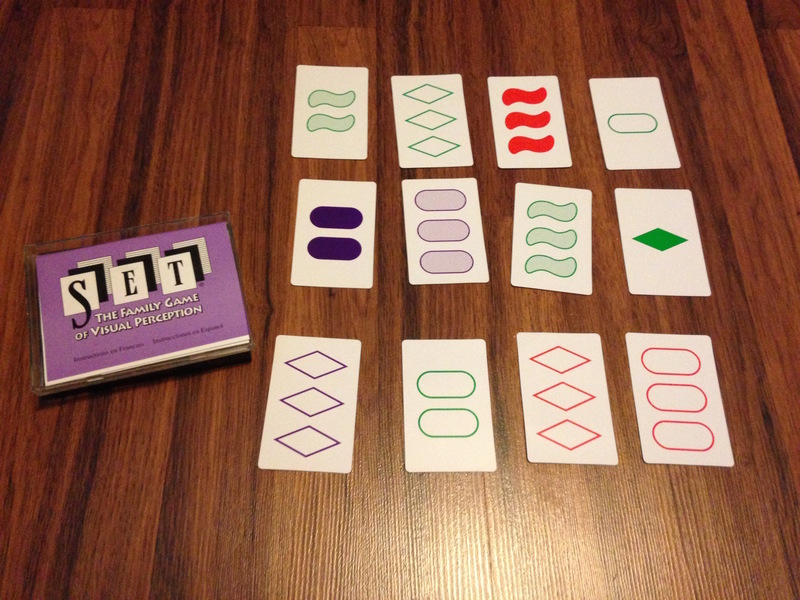 The game is played thusly: a grid of twelve cards is laid out in front of two or more players, and the players then rush to be the first to identify a set of three cards. A set consists of three cards whose features are all exactly the same or all different. Herein lies the mental gymnastics at the heart of the game. In this photo, the above set is quite easy to identify. The three cards all share the same shape (diamond), number (three), and shading (outline). Additionally, they all have different colors (green, red, purple). The second set is a bit trickier. The three cards share the same color (green), but all have different shapes (squiggle, oval, diamond), number (one, two, three), and shading (solid, outline, striped). While our brains are programmed to more easily see matching things, it’s harder to notice when all the features are different. Combine that with the real-time, racing element of the game, and SET is simultaneously a brain-racking and nerve-racking experience. Once a player identifies a set, he or she calls out “SET!” and points it out to the other players. If confirmed to be a legal set, the player collects the three cards. The empty spaces are replenished by new cards to bring the grid back to twelve, and the game continues. If all of the players agree that there are no identifiable sets within a grid of twelve cards, three more cards are added to the table. The game ends once the deck runs out; whoever has collected the most sets wins. SET is truly an amazing and unique game. It makes your brain work in a way that it’s not used to; there’s definitely a reason why it received a Mensa Select award. 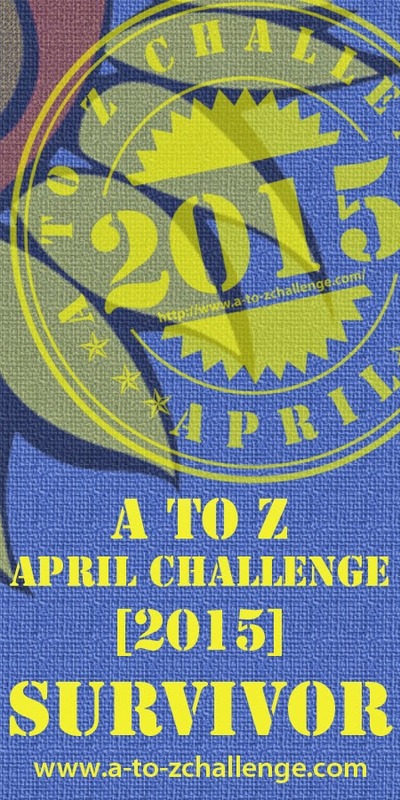 If you have competitive friends or family, it can get really engaging. I’ve had a lot of success playing SET as an opener or filler game during game nights, and have whipped it out while waiting around in airports or in long lines at comic conventions. 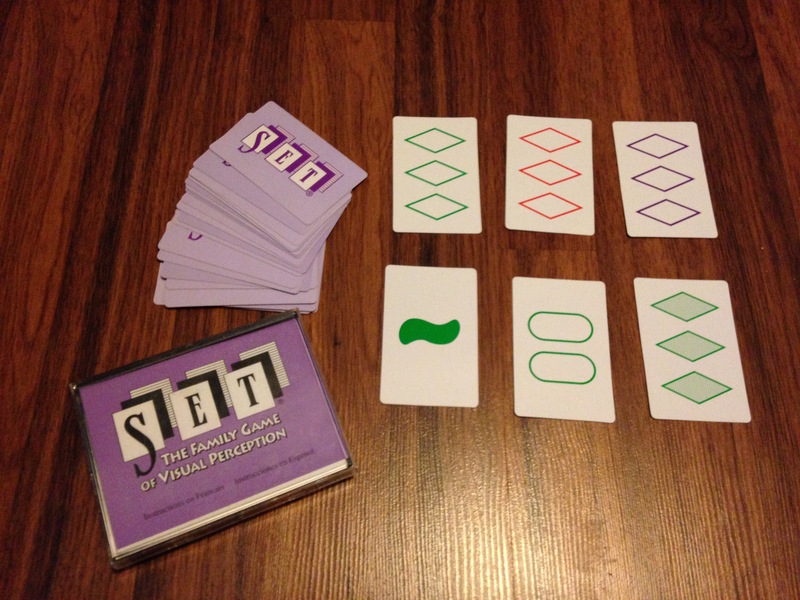 If you like puzzles or mind games in any way, I definitely recommend you check out SET. SET was designed by Marsha J. Falco and is published by SET Enterprises, Inc.